Melt a little butter in a large skillet. Heat over medium heat. Place one tortilla half in the skillet. On one half of the tortilla, layer 1/4 cup of the cheese, 1/4 of the scrambled eggs, 1 slice of ham and another quarter cup of the cheese. Fold the other half of the tortilla over, creating a pocket. Repeat for the remaining quesadillas. Cook the quesadillas for 3-5 minutes per side, until browned. Cut each quesadilla into four wedges. Serve with a dollop of salsa. This is the final post in our Easy Mexican Recipes Series. If you missed the others, see Chicken Tacos, Spicy Mexican Casserole, and Homemade Nachos. We hope you enjoy these Mexican-inspired flavors and recipes! It seems like everywhere you look lately, a magazine or website is talking about cheese sandwiches. They're hot right now (ha! couldn't resist! ), and the combinations go well beyond the ol' American cheese and white bread toasted on the stove. Fancy meats, fruits, veggies and a variety of cheeses are gracing the interiors of cheese sandwiches across the country (and across the media). It seems like this fall, we are in the age of the upscale cheese sandwich. With the cooler temperatures setting in, a nice toasted cheese sandwich is the perfect antidote for chilled toes and being wrapped tightly in sweaters. 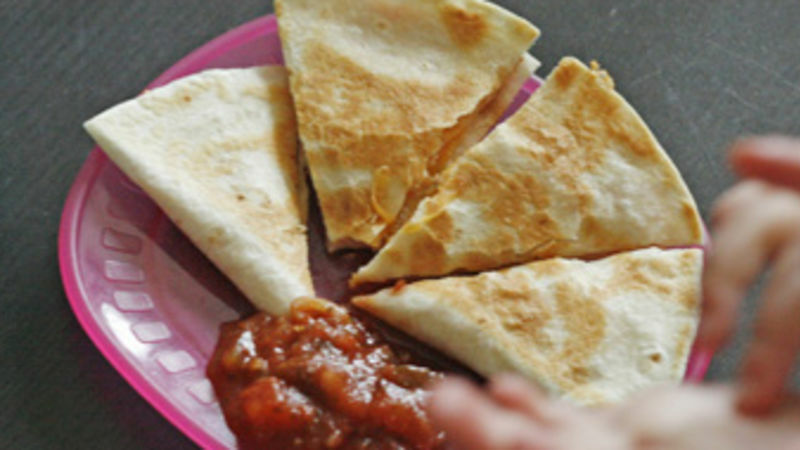 One of my favorite iterations of the cheese sandwich is the quesadilla though, which uses a tortilla instead of bread. Inside the quesadilla, there are endless possibilities as well. Change up the cheeses to give it French flair or country goodness. Add some different flavors to the center -- chopped or shredded meats, veggies, whatever. Today's combo? Ham, Egg and Cheese Quesadillas. These basic, simple ingredients combine for a fabulous, filling breakfast quesadilla, which is a lot like your favorite breakfast sandwich. It's perfect for a fast, on-the-go breakfast. Tender scrambled eggs are flanked with sharp cheddar and sweet ham (I prefer Virginia ham or honey ham, sliced thin). But is it really fast? I think so. It takes only about 10 minutes to make these tasty cheese sandwiches ... If you have leftover eggs, that keeps it speedy too. Looking for another delicious combination that isn't so breakfasty? Try Black Bean, Avocado and Red Pepper Quesadillas. Fabulous for a filling, veggie-filled option.